A recent CD discover has provided me with a ton of new photos of my Grandma's sister and her family. 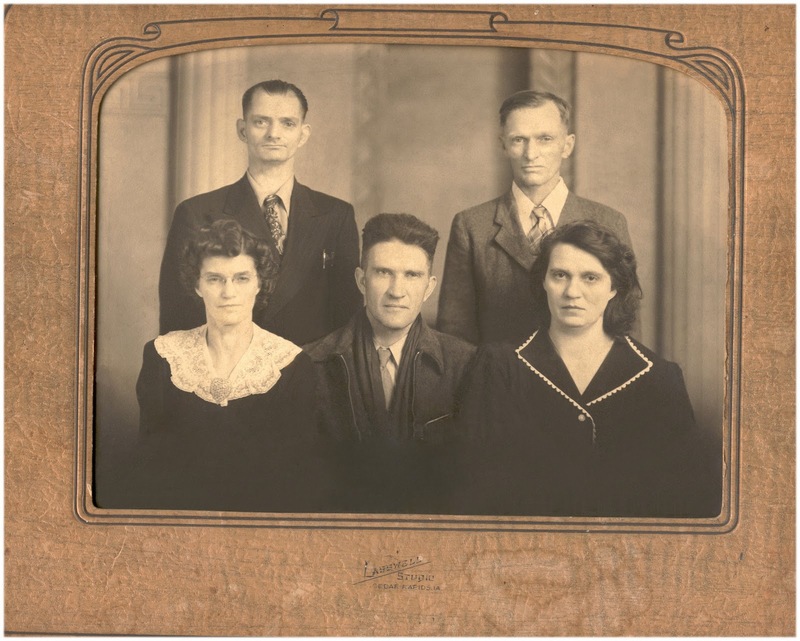 Among these photos was this treasure: an undated photo of my Grandma's father (Earnest Lindley - upper right) and his siblings. Back (L-R): Frank and Earnest Lindley. Front (L-R): Mary, Jim, and Francelia Lindley. As previously mentioned, I am unsure of the date of the photo, but judging by the ages of the siblings in the photo I would put it around the late 1920's or early 1930's. The photo was taken in Cedar Rapids, Iowa by Lasswell Studio (still in business, started in 1909). Sadly, the photo is pretty beat up. There are many discoloration marks, pen marks, grime, and what looks like a red-colored nail polish on the right side. Because this is such a great treasure for my family (we don't have many photos of our ancestors), I knew it had to be restored. The problem is that photo restoration can be expensive. So, I decided to tackle it myself and having limited experience with editing photos, this was quite the departure for me. I used a free downloadable photo editing software called GIMP and found it a bit tricky to use at first. So, after fumbling around for a bit, I decided that some playtime in the software was required and it got easier to use as time went on. In the end, I ended up really liking the software and will continue to use it in future projects. In the end, I'm happy that my first attempt at photo restoration and look forward to improving my skills. So, if any one has any tips for me, please leave a comment! My Grandma and her sister are very excited to see this photo of their father and his siblings. My mom told them that I had discovered the photo and that it was in bad shape, but not that I tried to restore it. I'm going to surprise them with framed copies at Christmas. I am sure they will treasure it as much as I do. 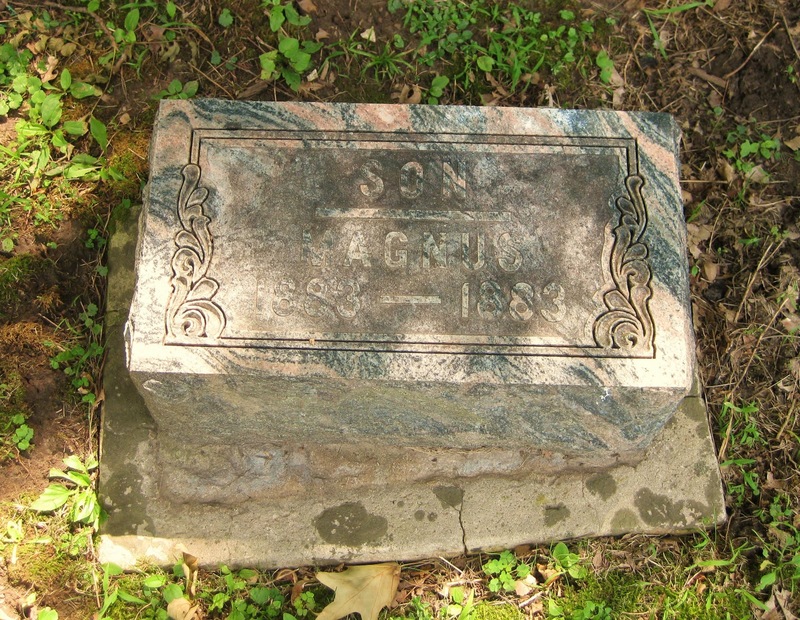 Magnus Hanson was born 30 Nov 1883 in Wisconsin to Hans J. and Antonette (Hoff) Hanson. Sadly, Magnus only lived for 10 days and passed away on 10 Dec 1883 of an unknown cause. 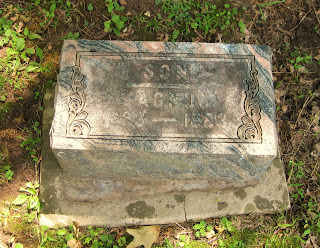 He is buried in the Immanuel Lutheran Cemetery in Richwood Township, Richland County, Wisconsin. Charles R. Tyler married Nancy Jane Burns-Townsend. This was the second marriage for Charles and the third for Nancy. They resided in rural Richland County, Wisconsin. Charles was 63 years old at the time and Nancy would have been roughly 49 years old.